Pork Dinner tonight! What a feast. 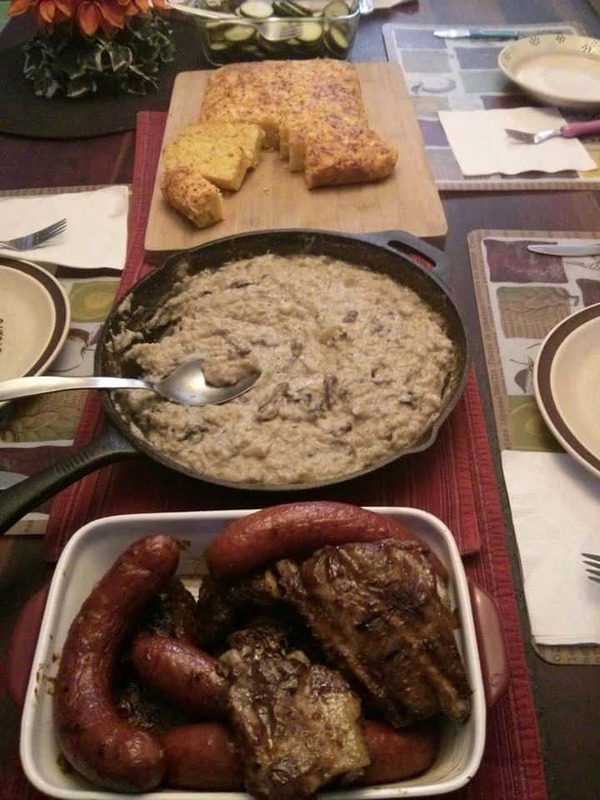 It was pork ribs and pork sausages on the bbq, a gravy/side dish (meat braising liquid, mushrooms, cauliflower to thicken, and about half a cup of a roux and a dash of milk), corn bread (recipe to follow in separate post) and cucumber salad. Best dinner I’ve had in a while! Sauce: Well, the ribs were slowly braised in the cast iron pan on the bbq for a while (just in some lamb stock), so once the ribs were removed, the chopped mushrooms and half a head of cauliflower were cooked in the remaining braising liquid until tender. Then I just melted about 3 tablespoons of butter, mixed in 3 highly heaped tablespoons of flour to form a paste, and spooned it into the vegetables. Since the cauliflower had started to disintegrate, this roux bound the whole thing together quite well. That cooked together for a while and we added just a dash of milk to get the consistency right. It was a thick gravy – you could spoon it onto the bread in piles! !